Garden Pearls Calcium Carbonate have many benefits. Increasing soil pH when needed is one of them. pH is short for “potential of hydrogen” or “power of concentration and hydrogen”. It is the measurement of concentration of hydrogen protons in a substance. When measuring liquids, almost all of them have a pH reading between 0 (battery acids) and 14 (bleach and liquid drain cleaners). 0 is very acidic (very high in hydrogen, H+) and 14 very alkaline (very high in hydroxide ions, OH-). Both extremes: a pH closer to 0 or a pH closer to 14 kills living organisms. Most organism have a very specific range of pH they are able to live with. Materials that have a balance of acid and alkali (e.g. pure water), have a pH of 7 and we call that “neutral”. To better understand this: Think about your upset stomach. You eat calcium carbonate (e.g. Tums) to reduce the acids. This is exactly how Garden Pearls Calcium Carbonate works for your garden! Many of our garden soils are low pH and may become too acidic from rain, watering, tree and shrub leaves, fertilizer or compost to successfully grow most garden plants. Soil nutrients are most available at pH between 6 and 7, slightly acid to neutral. 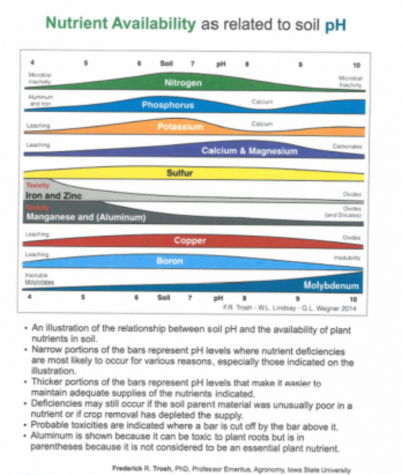 Nutrient availability depends on your soil type. Sandy soils release nutrients at a lower pH (pH 6) and require less Garden Pearls Calcium, but more often. Clay or soils with high organic matter release nutrients at a higher pH (pH 7) and need more Garden Pearls Calcium but less often. To be successful when growing plants, you must first know the pH of your soil and then make appropriate, gradual corrections by using Garden Pearls Calcium Carbonate (increases pH and calcium) or Garden Pearls Gypsum (which does not change pH but adds important Calcium and Sulfur). What is optimal or "correct" soil pH? Flowering plants in our gardens have very different soil pH and calcium requirements which must be considered. Some need a very high pH garden plot while others grow best in acids soils. Therefore, it is best to group plants based on their individual needs. pH > 7 Clematis, ivy, geranium, petunia, morning glory, forget-me-not, sweet pea, and many more like soil pH above 7.
pH 6.8 to 7.2 Neutral soils are well suited for dahlia, gladiola, chrysanthemum, iris, daisies, carnation, rose, tulips, and peony. pH 5.9 to 6.5 A slightly acid garden spot should be prepared for begonia, lilies, phlox, primulas, daffodils, and delphinium. pH 5.8 or lower Acidic soil is necessary for azalea, heather, heath, rhododendron, blue hydrangea, and fuchsia. View our Recommended Soil pH by Plant Chart to learn more.